You have the POWER to take a stand! Choose to not drink under 21 and to never ride with a drinking driver. ¡Tu tienes el poder de tomar una posición! y nunca montar en carro con un conductor ebrio. Since the ‘90s teen drinking rates have steadily dropped year after year. In 2015, teen alcohol use hit a historical low, and more teens admit that they don’t really approve of their friends who do binge drinking on the weekend (drinking a lot at once). In the last years, more and more teens agree that drinking, even one or two drinks, can be dangerous. Teens who drink alcohol are FIVE times more likely to drop out of school. You have the power to protect yourself – and your friends. Will you use it? Participate in Red Ribbon Week or other alcohol-free school activities. Find some fun in our Student Leader Toolkit. Take to social media! 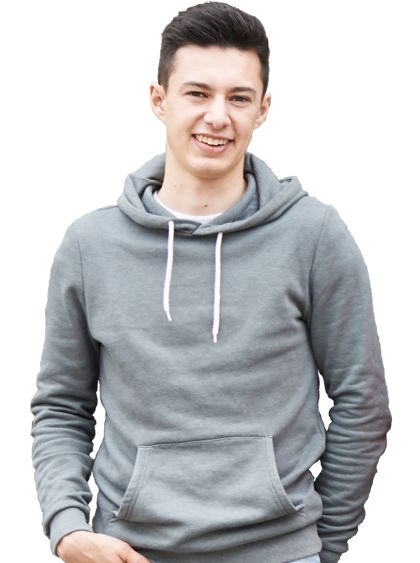 Use your influence by sharing your views on underage drinking. 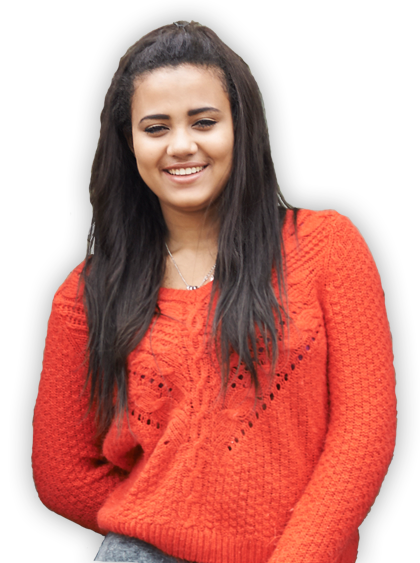 Read the Power of You(th) teen booklet where you can pledge to not drink until 21 and make plans to avoid peer pressure. 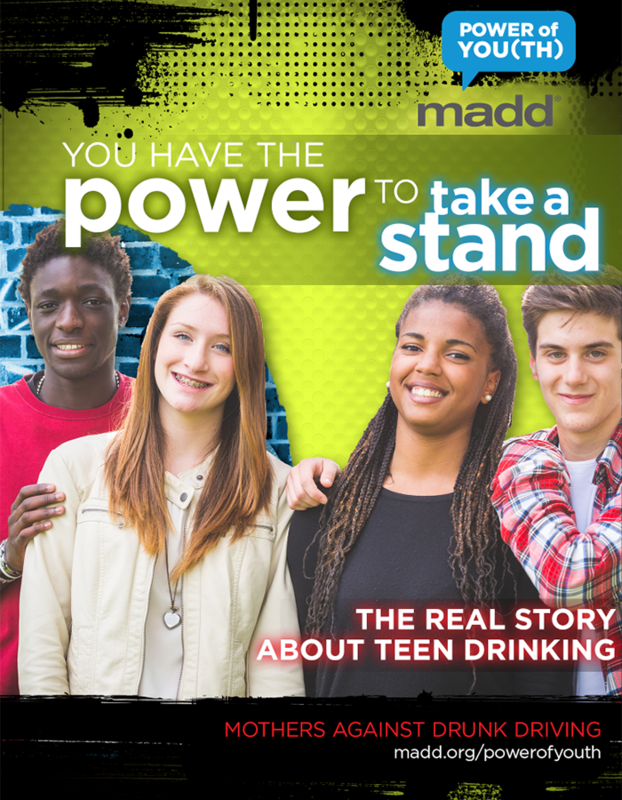 Share the Power of You(th) teen booklet so you and your friends can make a pact to never ride with a drinking driver. Pay attention – if you think your friend has a problem, don’t wait to speak up. Talk to a parent or trusted adult about your concerns. My friends and I know driving drunk is dumb, so we are fine right? Wrong! The reality is that more young people suffer injuries and die from alcohol-related incidences than from all other illegal drugs combined. 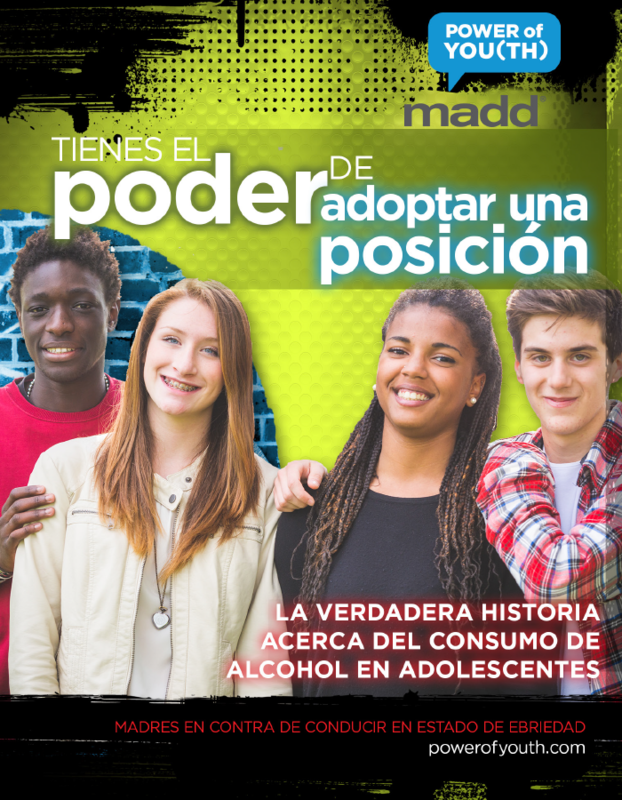 Alcoholism – Teens who start drinking at the age of 15 or 16 are FIVE times more likely to become alcohol dependent than adults who start drinking after the age of 21. Drowning, fires, and falls – Alcohol impairment can result in serious injuries that can even lead to death. Alcohol poisoning – Binge drinking can lead to alcohol poisoning. Call 911 if you think a friend has alcohol poisoning. Sexual assault and pregnancy – Alcohol can take away the ability to make safe and healthy choices or protect yourself. Getting caught with alcohol could lead to getting kicked off of a sports team, losing the driver’s license, or even jeopardizing college scholarships. “I don’t drink, so I have nothing to worry about…no need to talk about it.” Think again. One in three teens admit to being the passenger of a drinking driver. Have you ever been there? How can you keep you and your friends out of that situation? Have you ever thought about it? What can you do? Keep your friends safe: teens who believe that their friends are totally against riding with a drinking driver are less likely to hop in the car. Text a trusted adult a planned code word that you need a safe ride home. Download a rideshare app or have the number to a taxi so that if you are in an uncomfortable or unsafe situation, you have a way out. Believe that your parents or a trusted adult would rather pick you up than see you get hurt or worse. If necessary, the safest – and one of the hardest – things to do is call 911 to report a friend is driving drunk. It could save their life. Alcohol isn’t always an easy subject to bring up with your parents. 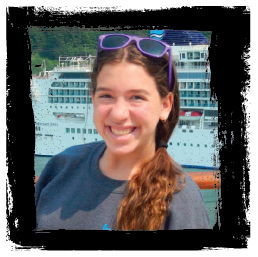 “My parents and I have always had an understanding that drinking alcohol wasn’t for me. I watched family members, close friends, and elders I knew let alcohol tear their life, dreams, and aspirations apart, and I told my parents that was not going to be me! I knew I wanted to live healthy: mentally, physically and spiritually, so I was determined to live each day responsibly without alcohol. I remembered a question my parents asked me: What’s your motive for drinking alcohol? And as I thought about it, I had no motive because I will face problems to the day I die and just drinking for a good time isn’t going to make my problems or issues disappear. Be honest with your concerns – Ask for support to develop a safe way out of a dangerous situation. Respect their opinion – You don’t have to agree with them, but it’s important to try to see things from their perspective. Don’t let the conversation about drinking get sidetracked by other issues or old arguments – If the discussion doesn’t go the way you hoped, try again later. This is important. Talking openly about alcohol can build trust and may be rewarded with gaining more privileges and independence. #ProtectUrSquad by bringing light to many immediate and long-term consequences of underage drinking. Take a photo with your squad and share with the hashtag. 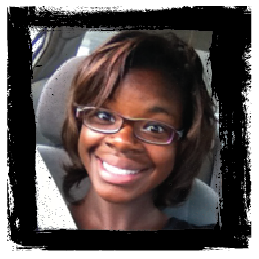 Invite others in your community or school to get involved! 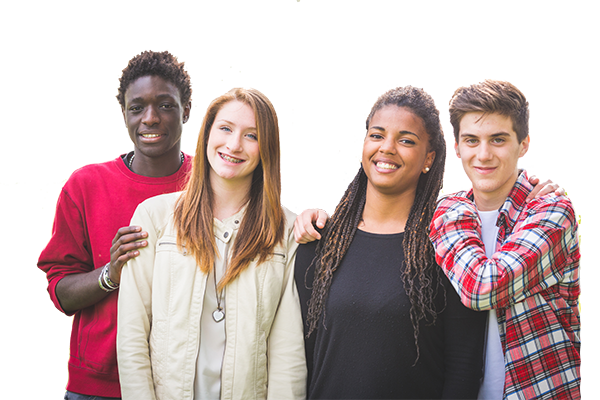 Share the toolkit below with others in your community who want to protect teens from the dangerous consequences of underage drinking. 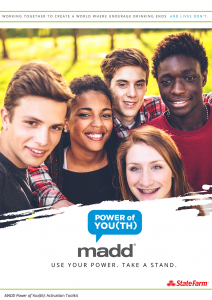 MADD has a toolkit specifically designed for Student Leaders, Educators, School Resource Officers, and Community Partners.